What an amazing 2012 Summer Trash Tour we’ve had at Rozalia Project for a Clean Ocean! Starting June 3, we boarded our 60-foot mothership American Promise: Captain Kyle Vowels, first mate Sloane Suciu, interns Kayla Lubold, Laura Dunphy and Blais Hickey, Rozalia Project’s director Rachael Miller and me, the Science and Education Coordinator. Over the next few weeks we towed our nueston net off the Isles of Shoals, removed thousands of pieces of trash from beaches on Frenchboro Island and beaches around Kittery, ME and Portsmouth, NH. We also tested out our new low bycatch neuston tow device called a Baleen Basker (bioengineered design based on a basking shark and baleen whale). During the first few weeks of this session we also had some other interns – Andrew Randazzo and Connor Grant – assist us with our marine debris removal, research and education. At the end of June, we attended the America’s Cup World Series races in Newport, RI and a new intern, Marina Maze, joined us. After the America’s Cup World Series we got another new intern, Laura Migliaccio, and had to say goodbye to some interns who had been with us for the first portion of the Trash Tour. Next we began our education-intensive portion of the summer, doing outreach programs in Edgartown, MA, Providence, RI, Newport, RI and finishing up with a week of education in Boston. In Boston, we docked at our usual spot at Courageous Sailing Center on Pier 4 in Charlestown Navy Yard and hundreds of sailing students helped us remove trash from the bottom of Boston Harbor with our ROV (remotely operated vehicle). 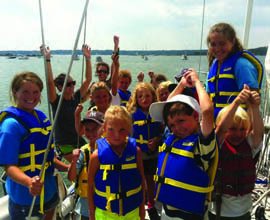 Besides our visits at Courageous Sailing Center and Community Boating Inc., we worked with some new outreach partners in Boston and went to new locations, namely Harbor Discoveries Camp at the New England Aquarium, Camp Harborview on Boston’s Long Island, and Jamaica Pond in Jamaica Plains. We were able to remove many bottles, cans, tires, ropes, and other miscellaneous pieces of marine debris from Boston Harbor, the Charles River and Jamaica Pond. We wouldn’t have been able to remove 275,863 pieces of debris and work with 7,751 people this summer without the tireless efforts from all of our interns. They endured seasickness, heat, cold and rain to help us further our mission of removing marine debris. Our fearless interns piloted the ROV, sailed at night, got covered in plankton, sand, and mud all to take trash out of our waterways and dispose of it properly. Their enthusiasm buoyed us all and their passion for our work is an inspiration. I can’t speak highly enough about their professionalism; we never heard a single complaint out of any of them! I feel lucky to have gotten to meet every single one of them and we couldn’t be happier to have them as part of the Rozalia Project team. We also had some special visitors onboard American Promise throughout our first session who also aided us in our mission and gave us indispensable support and their expertise. Thank you Martha Fisher, Art and Nancy Glidden, Sean O’Hallaran and Allyson Wilson! The next portion of the 2012 Summer Trash Tour kicked off with underwater trash hunting on Western Long Island Sound and STEM (Science, Technology, Engineering & Math) education with the VideoRay ROV at Larchmont, American and Beach Point Yacht Clubs in New York and with Schooner, Inc. on the tall shipQuinnipiack in New Haven, CT. We had a few more interns join us and some previous interns returned to help at various locations. In August, we had a table in the Ecozone! and operated our ROV as part of the Lake Champlain Maritime Festival in Burlington, VT. Following that, we sailed American Promise up to Portland, ME before returning to Boston to finish up our summer with more outreach programs and research of the density and distribution of marine debris in Boston Harbor. We look forward to many more breathtaking sails, incredible interns, excited students, and meaningful marine debris removal in the future. Keep checking back to read our blogs at rozaliaproject.org, visit us on facebook.com/rozaliaproject, youtube.com/rozaliaproject and pinterest.com/rozaliaproject, and follow us on Twitter.